My dad can totally take your dad! I picked up a couple of Racers sets yesterday morning, planning on testing my own in-bag building skills. 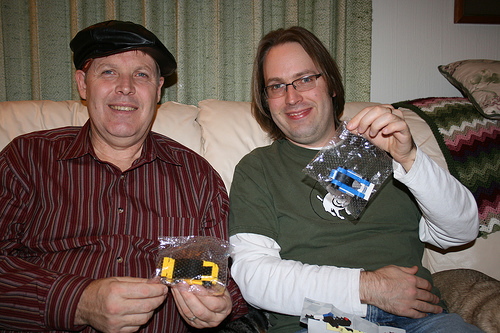 After Thanksgiving dinner today, I pulled them out and told my dad he could build one of the sets, and he insisted on trying an in-bag build himself. How cool is that? My stepmom was kind enough to play photojournalist for this special family event, so check out the full set of pics on Flickr.